There is also a bibliography, an index of variations, and an index of complete games. The author credits Joe Gallagher’s 1996 book, The Sämisch King’s Indian, as inspiration for taking up the opening, and he refers to it frequently during the text with regard to its influence on his repertoire. Montany considers the games of Sadler and Dreev as “the most instructive” and includes four games from each, while also including four from his own oeuvre. Two of Montany’s games are wins against the same opponent, one of which decided the Colorado State Championship, where his opponent prepared in advance with recommendations from Bologan. 1) b4, stopping Black’s queenside counterplay with …b5 in its tracks. 2) f3-f4, preparing e4-e5 often as a pawn sacrifice. 1 d4 Nf6 2 c4 g6 3 Nc3 Bg7 4 e4 d6 5 f3 0-0 6 Bg5 a6 7 Qd2 Nc6 8 Nge2 Rb8 9 Rc1! Bd7! Black’s best response to the rook move, simply protecting the c6-knight so that the b-pawn can advance. If Black plays 9…Re8 to prepare 10…e5, White can expand in the centre with 10 d5 Ne5 11 b3 e6! 12 Ng3 c5 13 Be2 exd5 14 cxd5 b5 15 0-0 with a good version of Yusupov’s Plan (see 6…c5) in R.Wojtaszek-D.Szoen, Sroda Wielkopolska 2005. Alternatively, the creative 10 Nd5!? paid off for super-GM Vitiugov after 10…e6 11 Nxf6+ Bxf6 12 h4! e5 13 d5 Nd4 14 Nxd4 exd4 15 Qf4 Kg7 16 c5 Bd7 17 Bd3 Be5 18 Qd2 Bf6 19 Kf2 h5 20 Qf4 Bxg5 21 Qxg5 Qxg5 22 hxg5 dxc5 23 Rxc5 c6 24 Rhc1 cxd5 25 exd5 Re3? 26 Be4! Bb5 27 Rxb5! axb5 28 Rd1 f5 29 gxf6+ Kxf6 30 Rxd4 Rxe4 31 fxe4 and a quick win, N.Vitiugov-A.Fier, Dubai (rapid) 2014. Combined with 9 Rc1, the text is the idea that has caused Black the most problems. White prophylactically protects c4 after moving his rook off of the long diagonal. He is essentially saying that because of his space advantage he can play more useful moves than Black can before forcing the play. Once Black plays a slow move or misplaces one of his pieces, the d4-d5 push will come with more strength than it would have if played on move 9. This is excellent in theory and has worked well in practice, but it takes good judgement to know which moves are useful and which are not. Playing over the games in this chapter and paying careful attention to when certain piece arrangements work and when they do not should help you to time the push correctly. a) 10…Ne5?! is risky when the retreat square on d7 is unavailable, and Dreev claims that White obtains a large advantage as follows: 11 b3 Nh5 (or 11…b5 12 f4 Neg4 13 Ng3 h6 14 Bh4 Nh7 15 Be2) 12 Ng3! f5 13 Nxh5 gxh5 14 Be2 Ng6 15 exf5 Bxf5 16 0-0, as in A.Dreev-M.Muhutdinov, St.Petersburg 1993.
b) 10…Na5! 11 Ng3 c5 12 Bd3 b5. After 13 b3 (notice how essential this move is!) 13…bxc4 14 bxc4 Rb4! 15 Nd1, going 15…Qc7! 16 0-0 Rfb8 would have given Black excellent play in S.Mamedyarov-I.Cheparinov, Antalya 2004. Indeed, 9 Rc1! and 10 b3! might best be thought of as prophylaxis against Black’s plan of playing the knight to a5. Black tires of waiting and strikes in the centre, but White has a nice rejoinder. The best move, 10…b5, will be analyzed in the next game. a) 12…b5 13 Be2 bxc4 14 Bxc4 Nb5 tries to exchange the bad knight, but 15 Nce2! avoids this and leaves White with a very pleasant position. He will have pressure down the c-file and access to the d4-square after driving Black’s knight back from b5: 15…Rb7 (Black probably does best to eliminate his weak backwards c-pawn, such as with 15…Qc8 16 0-0 Qb7 17 Rfd1 c6) 16 0-0 Qa8 17 Bd3 a5 18 a4! Na7 19 Qxa5 and Black’s opening was a complete failure in P.Van der Sterren-P.Enders, German League 1997.
b) Sämisch hero Matthew Sadler lost twice following 12…c5 13 Bd3 b5 14 0-0 e6 15 dxe6, once to Mark Hebden in 1988 and once to Michael Hennigan in 1995, though his position out of the opening was for preference in both games. I’m sure he kicked himself after the second loss, however, because after the following correspondence game he never got a third try: 15 e5! dxe5 16 Nce4!. White exposes the sham that is Black’s position for the price of a pawn. His pieces control all of the important central squares while both of Black’s bishops are passive, one of his knights is out of play on a7, the other is caught in a pin on the kingside, he’s weak down the d-file, and the c5-pawn is hanging. After 16…exd5 17 cxd5 Nxe4 18 Nxe4 f6 19 Be3 Bf5 20 Nxc5 just like that, Black is lost. He can’t protect the a6-pawn, defend his king, and blockade White’s passed d-pawn. White finished accurately: 20…Qd6 21 Bxf5 gxf5 22 Ne6! Rb7 23 Rfd1 Rd7 24 Qa5! 1-0, G.Lorscheid-M.Baer, correspondence 1995. Go back to move 15 and admire this amazing transformation of the position! Well done, Herr Lorscheid! Montany describes the Sämisch as a “faithful companion,” and writes that his “love for its dynamic h-file attacks, sacrificial pawn thrusts, boa constrictor grips, and suffocating space advantages compels me to share everything that I’ve learned with you, dear reader. Perhaps I will one day remember myself modestly as an expert on the opening. And because I don’t know whether my memory can be entirely trusted, I wrote everything down.” The prospective reader will be glad he did. It is a specious argument that only grandmasters or international masters are worthy of authoring opening books. Occasionally, as is the case here, a lower-rated author will focus on details and explanations that would not occur to someone further removed from his target audience by way of rating, and the book becomes accessible to a wider audience as a result. The Modern Sämisch is mostly geared towards competitive, highly-ranked players. 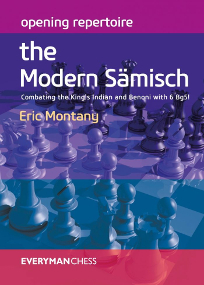 Yet given that Montany spends ten pages explaining the first six moves at the outset of the book, as well as taking time to explain the underlying themes of the positions at hand throughout the book, The Modern Sämisch becomes accessible to players of any level. Though, of course, the lower down the spectrum you are, the harder you will have to work. As with any work on an opening from Everyman, I recommend buying the ebook because it is available as a PGN file. This can then be used as a foundation for a repertoire database that you can build based on your own experiences and analysis. To my knowledge Everyman is the only publisher that does this, and it makes them the go-to choice for ebooks. Thank you for the excellent review, you clearly put some time into this.